I also like to keep things simple. Because less pressure means more fun. Last year I made a huge batch of beef chili (for the carnivores), a huge batch of pumpkin chili (for the vegetarians and vegans), I set up a chili bar with all the fixings you could dream of (pickled jalapeños, grated cheddar, sour cream, avocado, cilantro, diced red onions, corn nuts, limes, crumbled bacon, sliced scallions, nacho Doritos, boiled rice, buffalo sauce, etc. ), baked some cornbread and some cheddar biscuits, and made some killer veggie side dish to lighten things up a little. So huge all my friends asked me make it again this year. 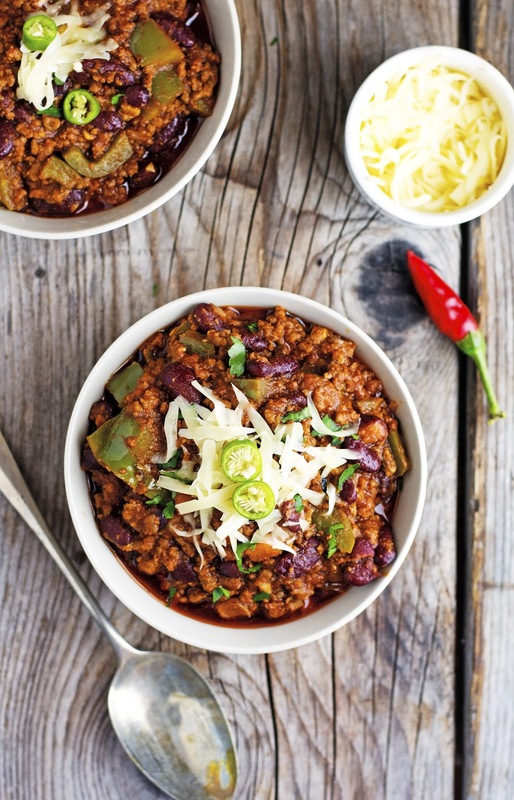 I know that to most people chili means game food, but believe me when I say that it’s also perfect for a New Year’s Eve party. Maybe not as fancy as lobster, caviar, or oysters. But so delicious and such a great way to feed a crowd and let everyone do their own thing. So this year I’m making again a giant pot of my beef chili, that from now on will be known as New Year’s Eve Beef Chili. 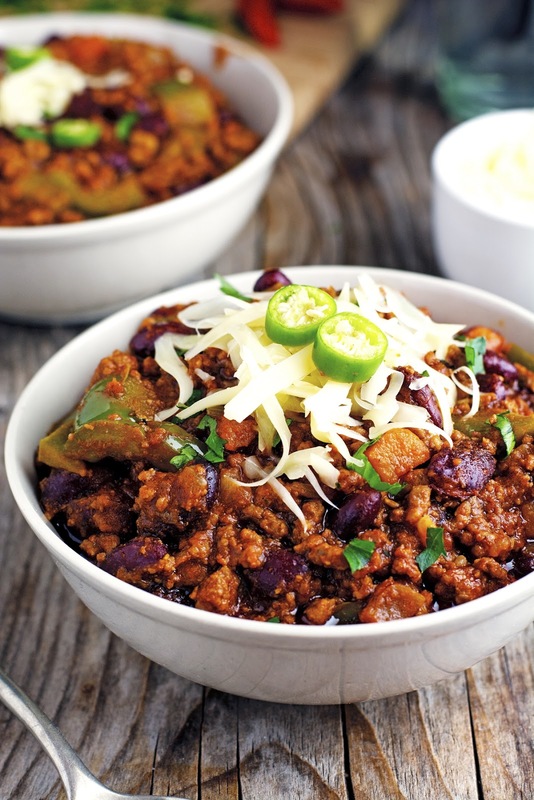 This chili is truly terrific and a snap to throw together. Perfect for New Year’s Eve or for any day of the year really. Thick, hearty, spicy, and meaty. So good! New Year’s Eve Beef Chili Print this recipe! 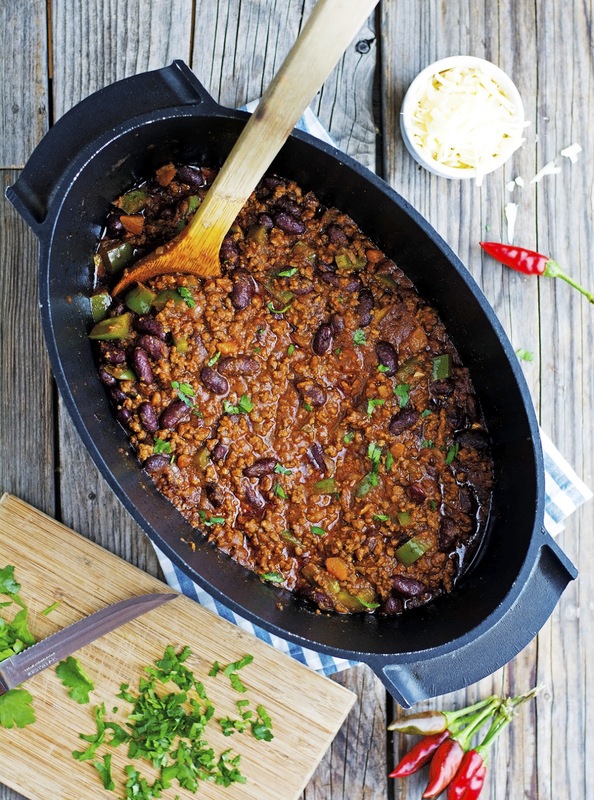 A couple of notes: First, this recipe makes a lot of chili, enough for 10 people. It can be halved for smaller crowds or doubled for even larger crowds. 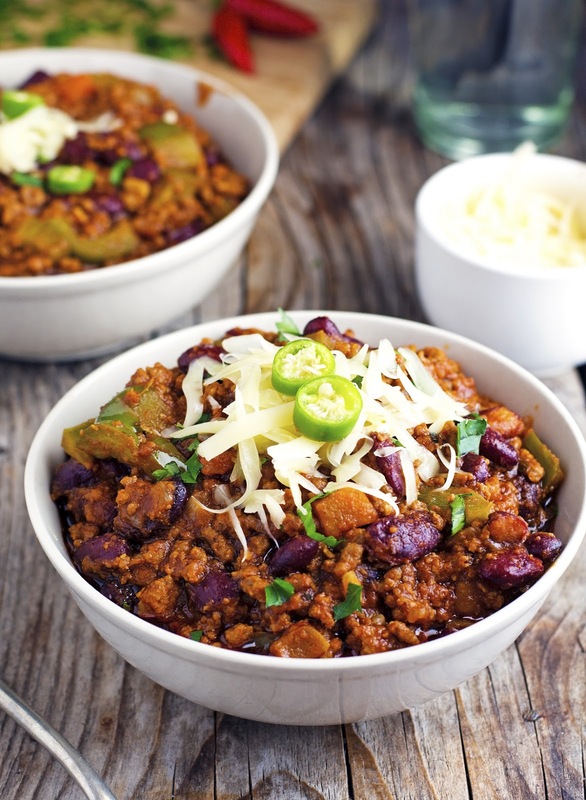 Second, depending on the brand, chili powders can be made from ancho chilies, cayenne chilies, pasilla chilies, or virtually any other hot pepper and can vary a great deal in terms of both taste and heat. Some are mild while others are volcano-like, so take a small taste before adding it and adjust the amount appropriately. I always recommend using a mild chili powder. *As mentioned before, chili powders vary from country to country, I recommend using one that is fairly mild and increase if necessary. Heat oil in a large pot over medium-low heat, add onions and sauté for 6 to 8 minutes, until translucent. Add garlic and carrots and sauté for 1 minute more, until fragrant. Raise the heat to medium-high and add the beef, stirring and breaking up any lumps until it is no longer pink, about 8 to 10 minutes. Add chili powder, cumin, paprika, oregano, and red pepper flakes (if using), and cook for another minute. Add tomato sauce, beef broth, and vinegar, bring to a gentle simmer, cover, and cook for 40 minutes. Add kidney beans, bell peppers, salt (I used 1 ½ teaspoons to get the seasoning right for my tastes, but feel free to use less or more), and pepper and simmer for 15 minutes more, or until the peppers are tender. One serving yields 432 calories, 23 grams of fat, 22 grams of carbs, and 33 grams of protein. I've never added carrots to my chili before, but what a great idea!! I love carrots in stews, so it'd be a total win. Happy Friday, Mike! As someone who LOVES spicy food, this winner is a total winner. Looking forward to trying it! Might be my go to for New Years eve Party.. add some corn cake and some homemade honey butter. Now a dessert to finish this off. If you wanted to do this slow in a crock...what preliminary steps would be important...just the onions and garlic?